Precontinent I, the first underwater-living project of Cousteau was carried out in 1962 near Marseilles. A small submarine chamber on the seabed at 12m was the home to two divers for two weeks. The experiment was a success and to take it a step further, the idea of Precontinent II came to life in 1963 in Sudan. The site chosen for the underwater village was at Shaab Rumi in the Sudanese Red Sea, about 35km from Port Sudan. The reef was the perfect choice for several reasons. Its marine life is one of the richest in the world. The reef is long and narrow and there is a beautiful lagoon where the supply ships were able to remain anchored. 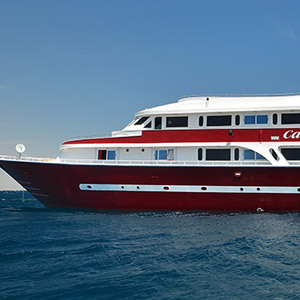 Cousteau’s Calypso and the Italian Rosaldo were the floating base for the experiment. They had huge compressors, generators and many other equipment necessary for the project. The location for the Precontinent II village was chosen to be close to the entrance to the lagoon, beside the external wall of the reef. The flat plateau provided the ideal place for the various structures which were built and assembled in Europe then transported to Sudan. The structures were fixed to the bottom by steel cables and 200 tons of lead. The Starfish House was where the 8-member team lived. 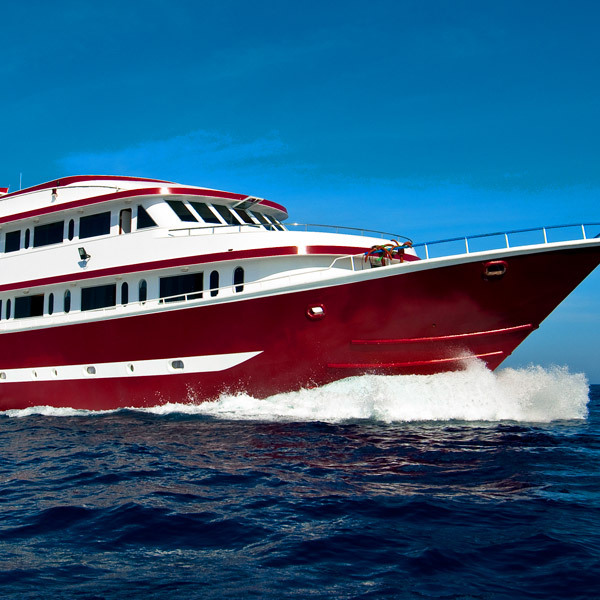 It was equipped with crew quarters with bunk beds and general areas with a bathroom, tables, chairs, technical equipment and instruments. The Sea Urchin (shaped as its namesake) was the hangar for the small submersible used to descend to 300m deep. 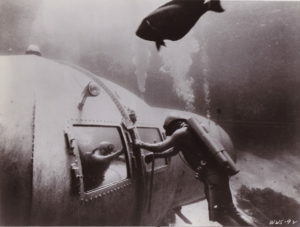 The large dome was full of air and the submersible was able to slide in and out through the bottom opening. The Shed was a long and narrow structure where tools, underwater scooters and all equipment were housed necessary for the divers on a daily basis. The Submersible Cabin was where 2 divers at a time spent an entire week. On the lower level the divers got out of the water and their scuba gear and showered. On the upper level were their accommodations but with a lot less frills than in their home base, the Starfish. 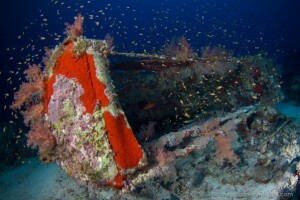 Even deeper, at around 50m shark cages were placed. 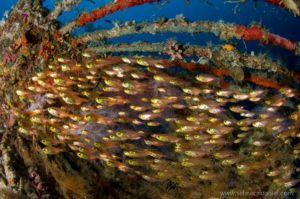 The Fish Coral housed an additional 25 other divers who performed various duties necessary for the upkeep of the structures and for the lives of the other 8 divers. They cooked, cleaned the outside of the structures from the fast-growing algae and seaweed and so on. After the experiment the two ”houses” (the Starfish House and the Submersible Cabin) were dismantled along with the expensive equipment however the other structures still remain. The hangar, the Sea Urchin, dotted with round portholes, is overgrown by amazing coral formations. It stands on its legs and underneath is an access into the inside. Colonies of glassfish make their home here, attracted by the dark and shady insides. Once inside the air bubble, you can breathe on your own. The sounds echo inside the lunar-looking structure. The Fish Coral is richly covered by sponges and soft corals that take one’s breath away. Lionfish can be spotted here and on occasion, blue-spotted stingrays. 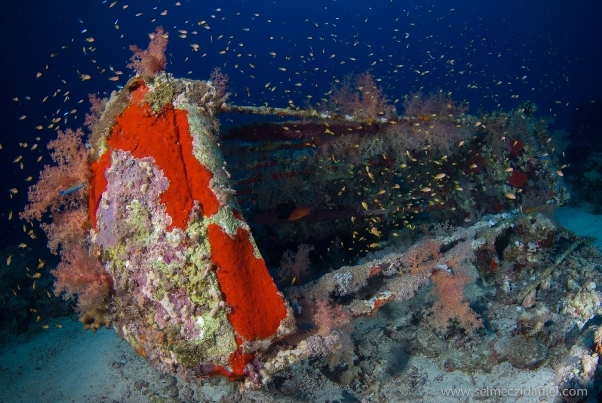 The tool shed is also covered with thick coral growth and around the structures are still visible the coral-encrusted steel cables that held them in place. The shark cages are a bit deeper, at 30 and 50m. They are also coated with corals and crustacean. Although fish life is not as rich as in the 1960s, there is still plenty to see and even sharks can be spotted near the cages.